My big seed order arrived!! I've been holding off on starting a full-fledged garden because I'm currently renting. Although I have a landlord who doesn't care much about what I dig up, the biggest issue is all of the tree roots and since my boyfriend and I will be (fingers crossed) buying our property in 2019, I don't want to go to all that effort. I decided that everything I plant this season will be in containers. I just couldn't wait any longer. I started small last year with some tomato plants, a strawberry plant (that the squirrels ate all up!) - which I hope comes back to life this year; and some herbs. My plans are a little more lofty this year! I kind of went overboard...but I'm in all or nothing this year! I'm planning a few areas for the garden. The first will be a Moon garden. The white Morning Glory species Moonflower blooms at night. The Blue Fescue is a shiny blue/silver ornamental grass that will also shine and the blue Morning Glory will give some colour during the day. I have to make some trellisses for the flowers to climb. 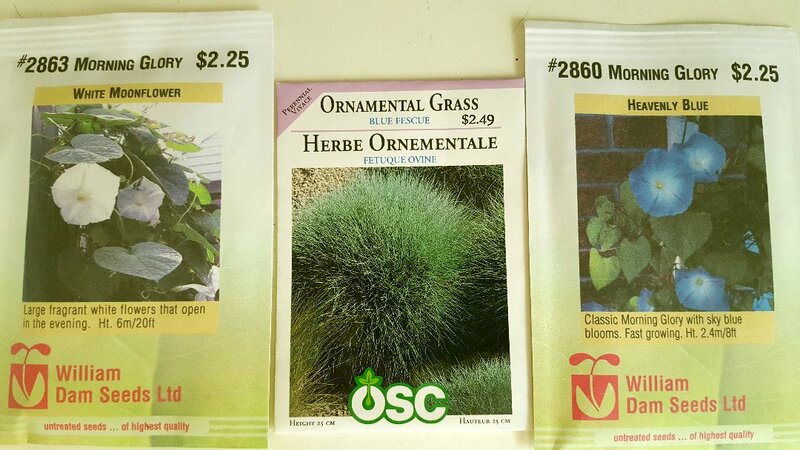 My porch garden will be herbs. 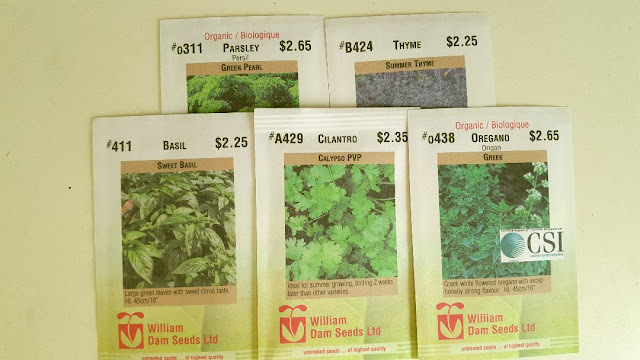 I used to plant a dozen different herbs, but I chose these five because they are the ones I use the most. I had great success last year with my herbs, except the thyme and oregano didn't even bloom. It could have been the seeds though, they were old. 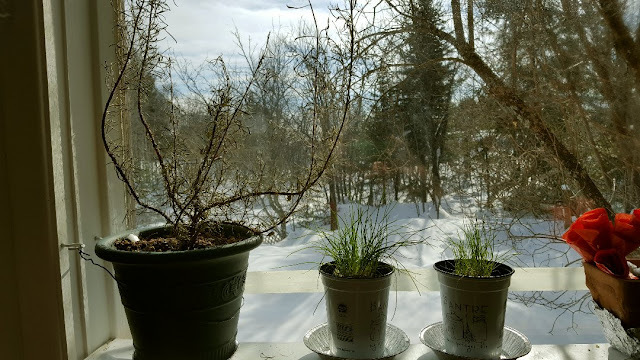 I still have some chives from last summer in my window garden and they are thriving. My rosemary...it's so dry no matter what I do, but I'm hoping it'll come back to life! I have an area that currently has some wildflowers. 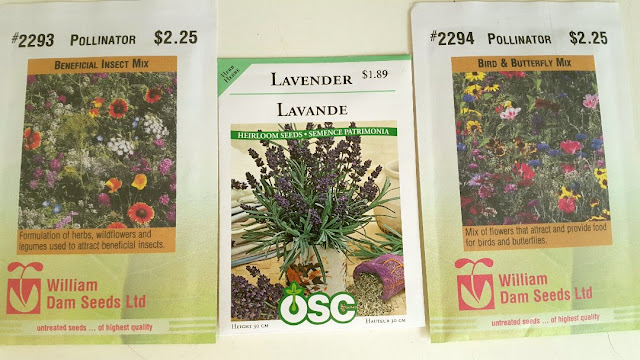 I'm going to add these Pollinators to that area and some lavender for my Bee and Butterfly garden. I have a lilac tree that attracts hummingbirds, and I hope they like the flowers as well! My Vegetable garden is my biggest hope. 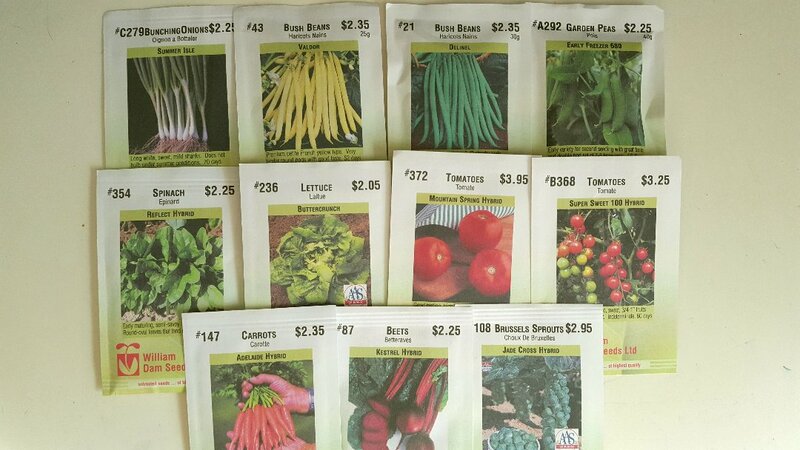 I chose a lot of different varieties and now I'm in the midst of doing research on container sizes, seed starting, drainage and soil needs. I'm going to get all of my containers at bazaars, flea markets, second hand stores or last resort...the dollar store. We are lucky that once a year, the town has an Earth Day and gives away compost. You just have to bring your containers, so that'll save me a little money. We have a lot of wood lying around too so I'll likely build some raised beds for the lettuce and spinach. The garden I'm MOST excited about is my pumpkin patch! This is the only seed that will go directly into the ground. I have to assess my space when spring comes to see how many I can plant. I chose most of the seeds because they either grow well in containers and/or are very hardy for Northern climates. This will take some work to begin with because I'm going to dig up an area that is currently packed with these. I have no clue what they are, nor does the landlord, he said a previous tenant planted them. 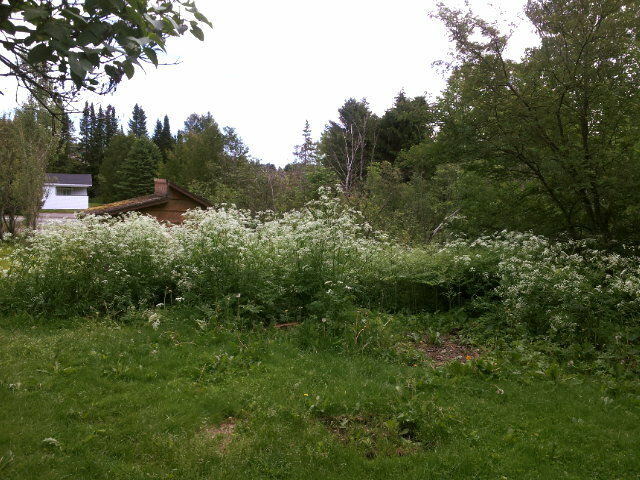 THESE grow like weeds and took over a big portion of our yard last summer. 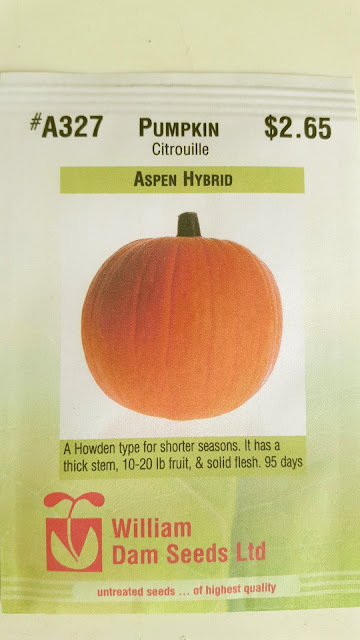 We liked them for privacy but I want to clear an area for the pumpkins this year. 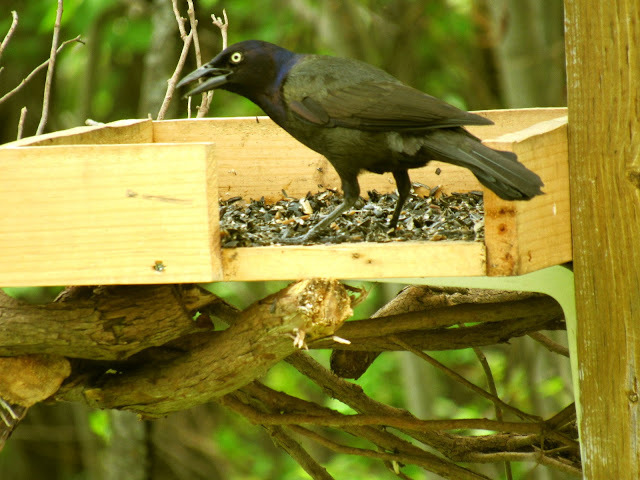 I'm going to put up a little fence and some netting around the patch as well, my neighbour says these grackles love to eat the blooms. I also got a little gift from the seed company, red and white Zinnias for Canada's 150th. I'll put those on my porch too! 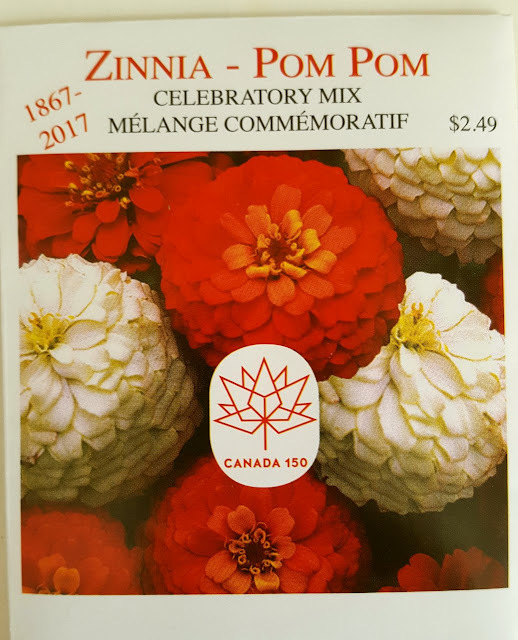 And I went a little more nuts and ordered more seeds yesterday gasp...yellow peppers, marigolds and nasturtiums for my porch. I have to stop! 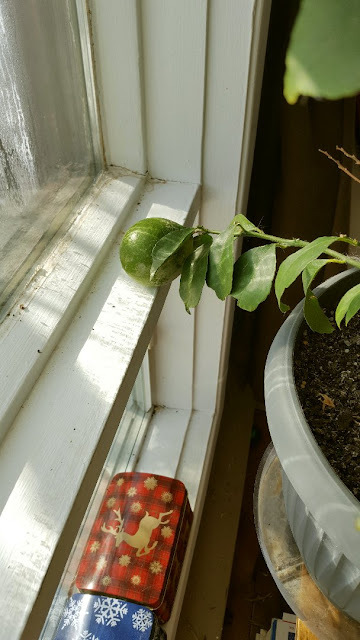 And of course, from last year, I still have my Meyer lemon tree. In the last few weeks we've been getting more sun and I've noticed 6 new lemons beginning to grow! This big one has been the same size since I brought the tree in last fall, it never turned. The nursery where I bought it is closed until March 15th so when they open, I'm going to visit and ask for some advice. I really hope we get some YELLOW lemons this year! I've heard advice to start small...but honestly? I'm starting BIG. I don't work, I'm on a disability income, so I have the time to spend outdoors. Plus I have the motivation! Last year I pretty much spent April through the end of October on my porch anyway, I love being outside and this winter is long and hard to handle. But doing things to plan for the garden is cheering me up. 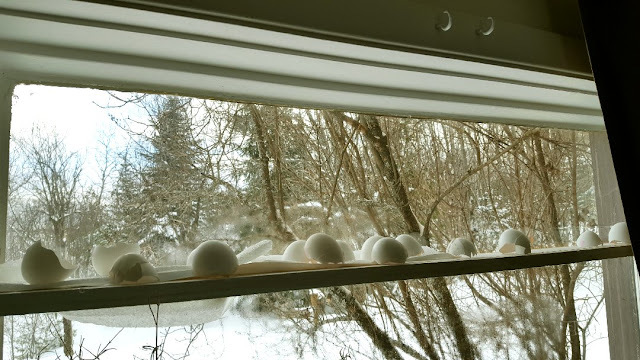 I started keeping my eggshells and they are periodically drying out on my seedling shelf - I read that they are good for calcium for the soil. I also am keeping my coffee grounds to add nitrogen where needed; and to keep the feral cats away - I do hope that works, this town has a problem with feral cats unfortunately. 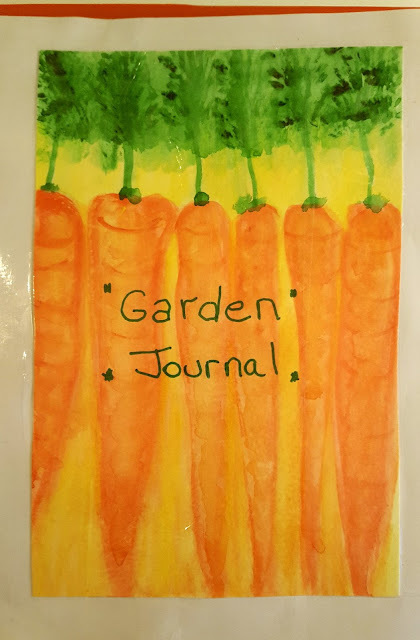 And I'm keeping track of everything in my Garden Journal. I'm really having fun with this! My hope is that when we have bought our property, I'll have some experience and then slowly move from container gardening to a larger garden. The goal is to grow to feed us for the year (not this year though); and eventually find a way to grow during the winter as well! We still have a ways to go before spring! These are our two huskies, Charlie and Marlene. 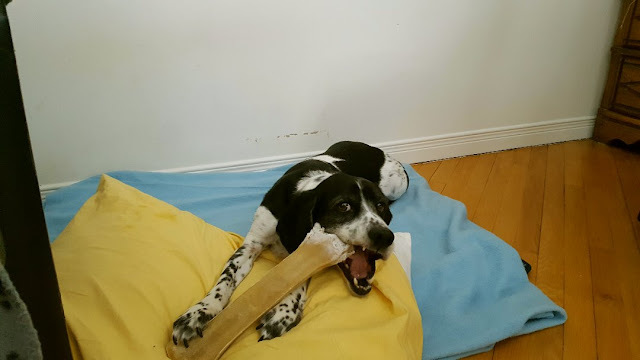 And my special little guy Jack always keeping me company with his big mouth eating bones...we adopted these rescue dogs in 2015. I feel so blessed to have dogs in my life again. After having to say farewell to my pugs in 2011 and then 2014, it was a long year without any dogs! 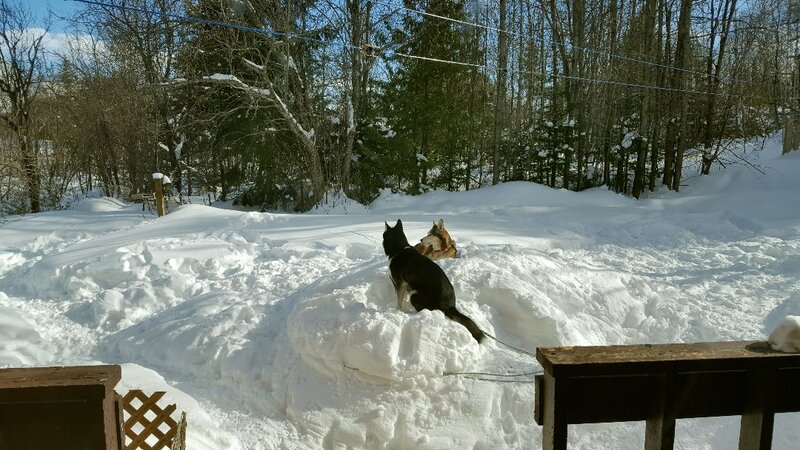 Half of the yard is where they'll hang out all spring/summer and fall, so there is room for the dogs to play and for my garden to grow! Rain! This is WONDERFUL! No,I don't think you're going overboard with your garden plans. This is how the gardening bug hits all of us. With every single thing you try, you learn something. Remember the saying: "In gardening there are no mistakes, only experiments." You'll be surprised how many changes you'll make for the season after this first one. 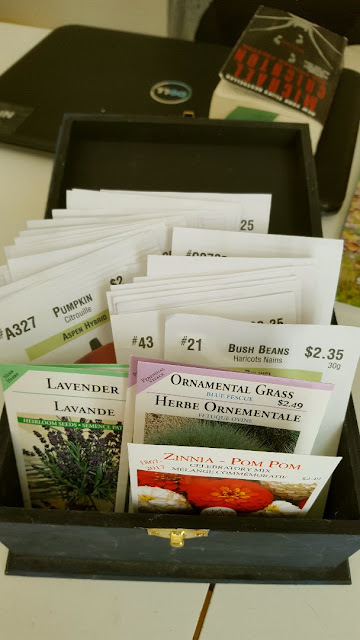 And be prepared as it probably means buying more varieties of seeds, working up a little more soil and scrounging up more containers! 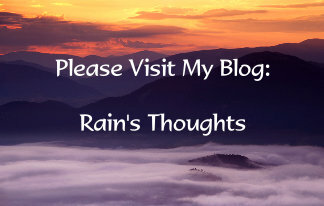 Rain, I'm thrilled that you started a blog! It is such a wonderful way to share plus record your own journey. Container gardening is a wonderful way to garden. As Mama Pea put it, those experiments often help you learn about your soil and climate and fine your gardening. You blog will help you keep track of all that. Photos are great too! Thank you Leigh :) Everyone is very supportive and I'm very grateful for that! I'm looking forward to sharing but also learning from others (and myself) as I go! Good for you Rain! Great read and super photos. I was especially interested in your Meyer lemon. My Meyer did well even after transplanting from pot to orchard area but this winter has been a very rainy cold one and it hasn't done well even with appropriate cover and encouragement. I will be interested as to how your plant fairs. The fiber group I go to weekly has a gal in it who works at a local nursery. We both agreed that my plan of just letting it go and not stress it by pruning the dead leaves and such off right now would be the ticket. A wait and see. Meyers make the best lemon bars! Glad you are blogging. Thanks Goatldi! I just followed your blog too :) Hmmm...interesting about the lemon tree. 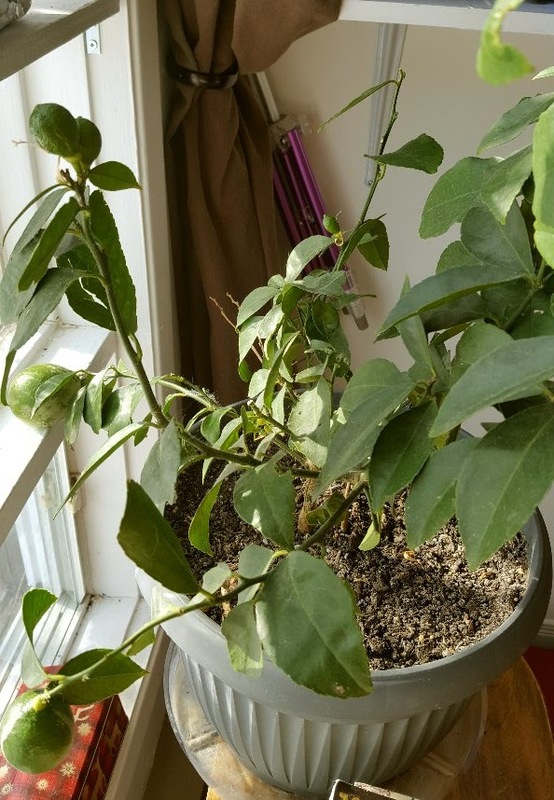 I had no real hope for it only because of our climate, I thought it might wilt and die over the winter, but surprisingly it's doing okay. I'd LOVE to see some YELLOW this year! I'll keep you posted! Oh, the lady at the nursery where I bought it gave me some fertilizer for it...but one of my dogs ate it, I remember her saying that during the winters, it would fare well to fertilize it a few times, but since I have none left, I couldn't try that suggestion out. 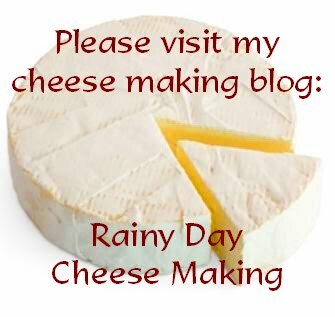 Do you have a photo of yours on your blog?